John Rambo (Sylvester Stallone) is a former member of an elite United States Army Special Forces unit and was awarded the Medal of Honor for his service in the Vietnam War in which he was a POW. The film begins 10 years after the war, in the American Northwest in December 1982. Rambo is searching for one of his friends from his unit, Delmare Berry, by traveling to his farm. Rambo soon learns from Delmare's mother that he has died a few months earlier from cancer due to Agent Orange exposure. Although not yet revealed to the audience, Rambo knows he is now the last surviving member of his unit. The scene cuts to Rambo entering the small town of Hope, Washington State (actually Hope, British Columbia) on foot. With his long hair and military-style coat, he is quickly spotted by the town's overzealous and paranoid sheriff, Will Teasle (Brian Dennehy) who quickly drives Rambo out of town, noting his strong distaste for "drifters." A defiant Rambo heads back toward town immediately, to the dismay of Teasle who arrests him. 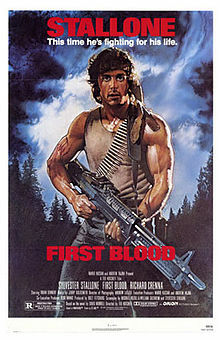 Rambo stands his ground against the officers at the station and is brutalized and harassed by Art Galt (Jack Starrett), the sheriff's cruel head deputy and closest friend. While being processed, Rambo has flashbacks to his time as a prisoner of war. When Galt and two other officers (Chris Mulkey and David Caruso) attempt to dry-shave him with a straight razor in preperation for his court appearance, Rambo has a flashback to being tortured in a North Vietnamese P.O.W. Camp back in 1969 and loses control, escaping on instinct using his military training. He fights his way out of the station, assaulting most of the officers, throws a civilian off a motorcycle, steals it, and is pursued into the nearby mountains.